Until Friday, you can get R.C. 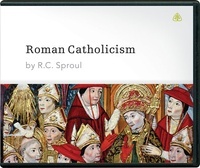 Sproul’s teaching series Roman Catholicism on CD for a donation of any amount. The Roman Catholic Church claims to be the one, true church established by Jesus Christ. The Reformers of the sixteenth century rejected this claim, pointing to numerous conflicts between Scripture and Roman Catholic doctrine and practice. What are the differences that divide Roman Catholics and Protestants? Are they important? In this series, Dr. R.C. Sproul carefully and respectfully looks at the doctrines that are at the heart of the Catholic-Protestant divide. Get the complete Roman Catholicism teaching series on CD for a donation of any amount.